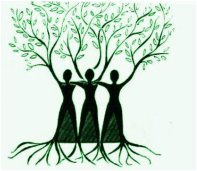 The coming together of women to offer love and support to one another is hugely special and nurturing. In former times and in many indigenous cultures women live and share together on a daily basis. Such support is invaluable and is often missing in today's society. I have held women's circles and sharing groups and am part of a small, closed women's group that meet on a regular basis. I am keen to support women supporting women, if you have any questions or would like to discuss related issues, feel free to get in touch. Here is an article regarding the value of women gathering in cirlce that may also be of interest.